Last updated 18:00GMT, Tuesday 25 November. TODAY: very busy inbound traffic Dover. heavy snow northern Sweden, Georgia. H13 Locarno-Brissago, Switzerland, still restricted by landslide. The M20 coastbound J5-6 at Maidstone is closed overnight this week – 20:00-06:00 – until Thursday. Diversion in place. NEWS: there were an extraordinary number of major crashes in France yesterday. The busiest roads in the Netherlands identified. Norway wants ‘slippery road’ training for HGV drivers. CHANNEL DELAYS: there may be some slight delays for Dover-Calais services. WEATHER ALERT: Amber alerts fog overnight Ireland + storm south east France. WEATHER: mostly mild. Rain Iberia, France. Showers Italy. Turn cold North. MAJOR TRAFFIC DELAYS: A630 ring north Bordeaux, clockwise, road works, delay 60mins. A13 + A12 inbound Den Haag, accident, delay 45min and 40mins. A8 westbound Stuttgart, accident, delay 45mins. A1 northbound from Bern, incident Hindelbank delay 1h25. A2 southbound Lugano, breakdown, lane closed delay 1h50. Earlier: now no delay A15 westbound Rotterdam, A7 northbound to Brussels, A46 westbound from Monchengladbach, A9 southbound to Nuremberg. A3 northbound from Cologne-Dusseldorf, earlier incident Hilden, delay down to 35mins. A9 northbound Montpellier-Nimes, earlier accident Gallargues, delay down to 20mins. There was almost a week’s worth of major crashes in France yesterday. So far there’s no rhyme or reason (or indication of how many casualties were involved). As far as we know it cannot be explained by weather conditions. The chaos started in the morning with an accident on the outbound A13 in Paris followed later by jams both ways into Strasbourg on the A4/A35. 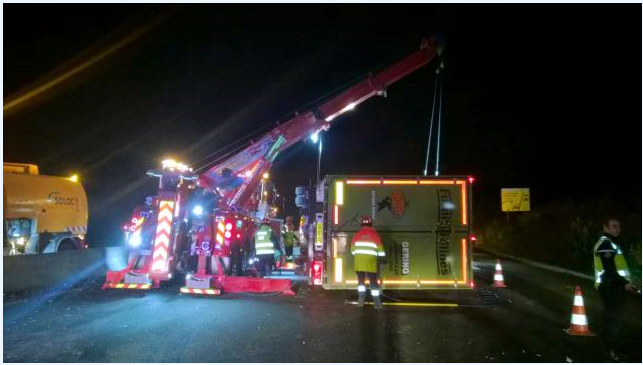 The A1 northbound into Lille and A29 westbound from Amiens both also saw multihour delays in the afternoon followed by more accidents on the A7 into Lyon, the A62 towards Toulouse and the A86 ring in north Paris. Finally, the A10 at Orleans was completely blocked by an overturned truck in the evening, followed by a truck fire at almost the same location overnight with delays lasting until this morning. Photo via @VinciAutoroutes, A10 Orleans. roundup: NETHERLANDS. The A15 between the Benelux Tunnel and Vaanplein south of Rotterdam is the most congested road in the country says a new report, followed by the A27 Utrecht-Breda at Gorinchem and the entire stretch of A58 between the A16/Breda and Eindhoven. Recent investment in the roads has reduced congestion overall it says but there are signs jams have worsened this year says DutchNews.nl. NORWAY. Foreign truck drivers should be forced to attend winter driving courses says the government as they are apparently over-represented in accident stats. While the plan just applies to foreign resident drivers, transport minister Keil Solvik-Olsen also wants an EU qualification in ‘slippery driving’ says thelocal.no. when do we have news about REGINA LINE starting a ferry service from harwich,uk to denmark. Was this just a publicity stunt ?? good question. not a publicity stunt I don’t think, but it has all gone very quiet. doesn’t look good – a couple of enquiries from us have gone unanswered recently. Hoping to write it up this morning.